The Norwegian Forest Cat is accepted by the CFA in every color and pattern (with the exception of those showing hybridization resulting in chocolate, Himalayan patterns, lavender/lilac, or these combinations with white). The color and pattern should be clear and distinct. In the case of the spotted, classic and mackerel tabbies, the pattern should be well-marked, distinct and even. While cats of this breed (Nicknamed “wegies”) do develop a very heavy winter coat, surprisingly, grooming is not a big concern with these cats. An occasional bath to keep the coat clean and shining, plus combing regularly is pretty much all the maintenance that is needed. In spring the heavy undercoat sheds within a few days, requiring extra brushing, and of course, as with all domesticated cats, don’t overlook routine nail trimming. Although not usually a cuddly lap cat, the Wegie enjoys and seeks out constant human companionship. They’ve been known to develop an extreme loyalty to one family member. Intelligent and very curious, they are a well balanced breed and do not stress easily. While not overly demonstrative and demanding, they do love giving head bonks and receiving chin and neck scratches. 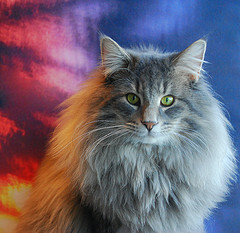 Naturally evolved to suit its environment, the Norwegian Forest Cat is a large and robust breed. The coat has two layers. The outer coat is silky, and in winter has a thick underlayer, a full ruff around the neck and britches along with the expressive and gloriously plumed tail carried proudly the whole year round. Heavily muscled hind legs make them great jumpers and climbers. These cats have a triangle shape to the head and almond-shaped eyes with and upward tilt which give it a somewhat exotic look. 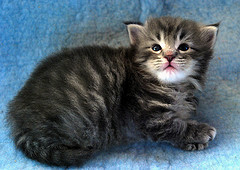 While brown tabby and white is the most popular, the coats come in a great variety of patterns and colors. This breed traces its ancient origins to Norway and has a reputation as a skilled hunter, intelligent and cautious. These noble creatures are the cats that explored the world with the Vikings, protecting the grain stores on both land and sea, and fierce mousers they were, too! Their Norse name, “The Skogkatt”, meaning forest cat, is accurate, in that this breed really did come out of the Scandinavian forests some time in the last 4,000 years. But regardless of their working cat background, these are among the most companionable and people-oriented of cats. The Norwegian Forest Cat easily adapts to almost any household situation. They usually have a calm personality, sweet temperament and tend to display an uncommon patience with gentle children. Wegies also bond with dogs and other family pets. They do get lonely without playmates though, so please provide a companion when leaving your Norwegian for long periods. This cat is slow to mature, not being considered fully mature until 5 years of age. Extremely intelligent and alert, these silky soft, classy cats will demand (and likely receive!) lots of petting, head-bumps and chin rubs.